People eating out at a fast food restaurant. Many Americans lead busy lives and don’t have a lot of time to prepare food for their families. Faced with greater time constraints from work, childcare, and commuting, they often turn to convenience foods. Convenience foods are defined as types of foods that save time in food acquisition, preparation, and cleanup. Convenience foods are restaurant meals and ready-to-eat food from grocery stores. The ready-to-eat food encompasses many types of food ranging from bananas to frozen pizza that require little or no preparation. Although these convenience foods save time, they tend to have lower nutritional values and can be more expensive than food that takes more time to prepare. In our recent report, Consumers Balance Time and Money in Purchasing Convenience Foods, we use USDA’s 2012-13 National Household Food Acquisition and Purchase Survey (FoodAPS) to explore why Americans purchase convenience foods, what types of convenience foods they purchase, and the factors affecting their decisions; such as time constraints, prices, the food environment, and financial resources. More specifically, we examine how each factor affects foods with varying degree of convenience that consumers purchase: fast-food, full-service restaurant meals, ready-to-eat foods from grocery stores, or non-ready-to-eat foods from grocery stores. Employment creates time constraints from both the time spent working and the time spent commuting. These time constraints shift consumer demand from grocery store foods to restaurant meals. The shift to full-service restaurants is most notable when all adults in the household are employed. 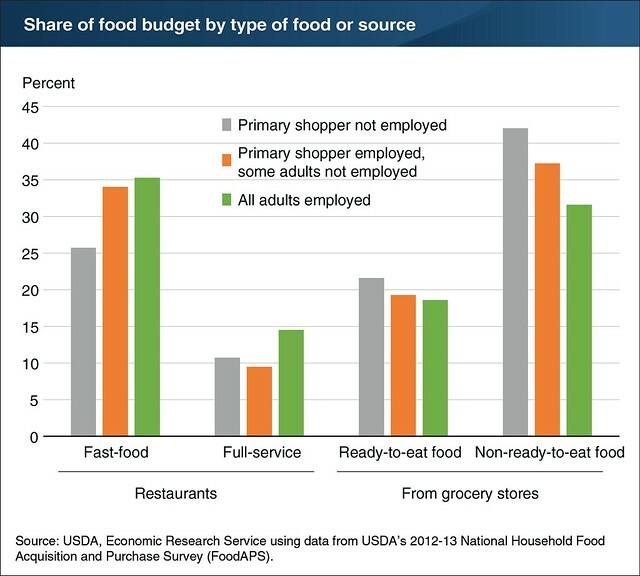 Households where all the adults are employed purchase 12 percent less ready-to-eat food from grocery stores and 72 percent more food from full-service restaurants than households where not all adults are employed. Having children in the household also affects convenience food choices, both because parents select foods they believe their children will eat, and because parents spend time taking care of children and therefore have less time to prepare food. 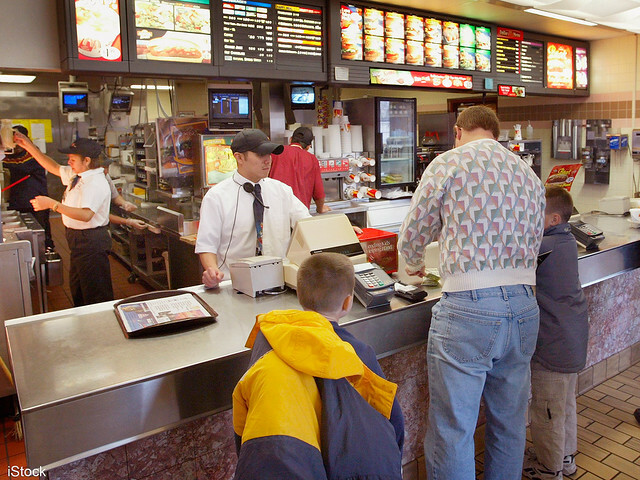 Households with children purchase 19 percent more fast-food meals and 38 percent less full-service restaurant meals than households without children. However, as the number of children in the household increases, they purchase more foods from grocery stores and less from restaurants. In addition, single parents, who do not have a partner to help out with child care, purchase 14 percent more ready-to-eat foods than all other households. Financial resources also play an important role in convenience food choices. Convenience foods from fast-food or full-service restaurants tend to be more expensive than those bought from grocery stores. Not surprisingly, as household incomes rise, households shift from ready-to-eat food from grocery stores to fast-food and full-service restaurant meals. On the other hand, the Supplemental Nutrition Assistance Program (SNAP) provides program participants with funds to purchase food from grocery stores, and as a result, SNAP participants tend to buy more food from grocery stores and less from restaurants than non-participants who are eligible for SNAP. Consumers’ decisions on how much of different types of convenience foods they purchase is influenced by time constraints, prices, the food environment, and financial resources. Understanding what motivates these consumers to purchase convenience foods has important implications for public health, given that convenience foods are often associated with lower nutritional value. Time constraints due to employment are associated with greater preference for convenience foods. The researchers and "researched" seem to be growing more dependent on each other for existence. These 2 dance partners trade the "lead" as nature decides the type and cadence of the tune.